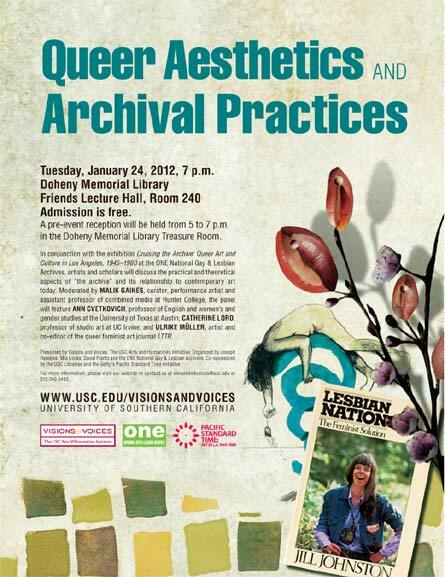 Tuesday, January 24, 2012, 7 p.m.
A pre-event reception will be held from 5 to 7 p.m. in the Doheny Memorial Library Treasure Room. In conjunction with the exhibition Cruising the Archive: Queer Art and Culture in Los Angeles, 1945–1980 at the ONE National Gay & Lesbian Archives, artists and scholars will discuss the practical and theoretical aspects of “the archive” and its relationship to contemporary art today. Moderated by MALIK GAINES, curator, performance artist and assistant professor of combined media at Hunter College, the panel will feature ANN CVETKOVICH, professor of English and women’s and gender studies at the University of Texas at Austin; CATHERINE LORD, professor of studio art at UC Irvine; and ULRIKE MÜLLER, artist and co-editor of the queer feminist art journal LTTR. by the USC Libraries and the Getty’s Pacific Standard Time initiative.